Sam Shelton is the Principal and Creative Director at KINETIK. 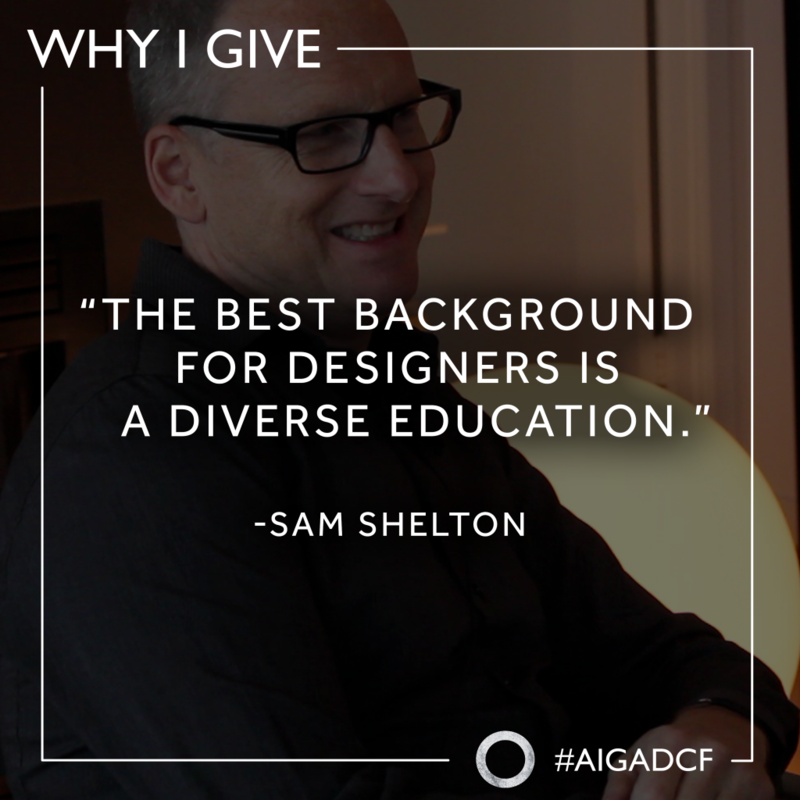 He is one of the charter members of the AIGA DC Design Continuum Fund and a donor. We met with him at his lovely home in Washington D.C. to discuss the benefits of education and supporting the future generations of designers. DCF: Can you tell us a bit about KINETIK and what kind of work you do? There was a lot of commercial building development in the late 80s and early 90s. So commercial developers spent a lot of money on incredible collateral to try to lease their buildings. [KINETIK] started in that niche and did work for architects and interior designers. Then there was one of those cycles of recessionary times. We realized that market was flawed because it’s susceptible to market changes. So [KINETIK] started doing nonprofit work which is primarily what we do now. We were doing a lot of design work and moved into digital. Now we do strategy and collateral, both print and digital with larger campaigns. DCF: What was your entrance into design? What was interesting about the three of us that started KINETIK is that I came from an architecture magazine background which is how we connected with architects and developers. Jeff Fabian[, Principal and Creative Director at KINETIK,] worked for BOMA, the Building Owners Managers Association, on collateral. Jean worked down in Houston doing high-end branding work. I had the magazine experience, Jeff had nonprofit experience and Jean had the high-end branding experience. So [KINETIK] had a little of everything going on which is why we were able to do it. [Our alma mater, Virginia Commonwealth University (VCU),] in general had a great curriculum for graphic design. We learned a lot about typography and formal issues that come with design. It was a great program and had a great class of students that still keep in touch. DCF: That touches in nicely with the Design Continuum Fund. Can you talk more about the benefits of a design education? My father was an educator. Teachers aren’t compensated well but my parents wanted me to go to school. They saw the benefits of going to college. Especially now, how do you afford school? It’s expensive. [Before VCU,] I spent two years at a community college and it gave me a bit of communications design. My experience at VCU was great. What I liked about it was that it was a university. I don’t think Jeff, Jean, and I would have started the business together without going to VCU. The common background really helped us succeed. [Later on] I was on the curriculum advisory committee for Northern Virginia Community College (NOVA). Pat Taylor was on it along with Tom Suzuki. They recommended me to the committee and I was on it for six years. It was an interesting opportunity for me to give back to my origins. NOVA really inspired me to move on to my four year education. [Then] I taught at American University for two year and I’ve been teaching at the Corcoran for the last twelve to fourteen years. I definitely get the value of education. The interesting thing about the Corcoran is that all the students work incredibly hard. Most at least work 20 hours a week, some work 40 hours a week in order to afford living in DC and going to school. So they have a full course load and work full-time. I think back and I was so fortunate. I had summer jobs or part-time jobs sometimes but it was just for spending money. That experience on the NOVA advisory board made me aware that a lot of these kids want to be in school but couldn’t afford it. How do you help that next generation of designers and do it in a meaningful way? The AIGA DC chapter had scholarship programs and mentorship. But Mira Azarm along with Beth Singer and I wanted the DCF advisory board to work together to hammer out what the continuum fund is. DCF: What advice would you give to young designers or people who are not sure if this is the right career for them? One of the things I think is the best background for designers is a diverse education. It does not have to be formal education. It can be life experiences. One of the interesting things about teaching at the Corcoran is a percentage of my students either left another degree program unrelated to design or completed a degree and coming back for an undergraduate degree in design. They bring these incredible experiences to the classroom and their projects. If I was just finishing high school, I would look for a program that had an aspect of social design and really focused on design’s influence on social change. The program has to touch on strategy. You can’t go to a school and all you do are artifacts. It’s not about artifacts but about the tools carrying out the strategy. The other thing is a school that really believes in design thinking and a design thinking process. The way designers work is very different from how a non-designer works when it comes to problem solving. There is a unique talent we bring to it because of the way we think is less linear than someone else in a different profession. That two valuable combinations can help businesses, non-profit organizations, and individuals who are into social change. Chelsae Blackman and Liz Rose Chmela are AIGA DC Design Continuum Fund committee members.